What are the most common uses for Room Dividers? By far the number one use is to create Religious Education classrooms (Sunday School classrooms). Personally, I am not sure whether children or adults are easily distracted. Regardless, an easy way to eliminate visual distractions and decrease extraneous distracting noise is to have a divider of sorts between the different classes. The divider helps cut down distractions and thus results in increased concentration on Religious Education classes for any age bracket. 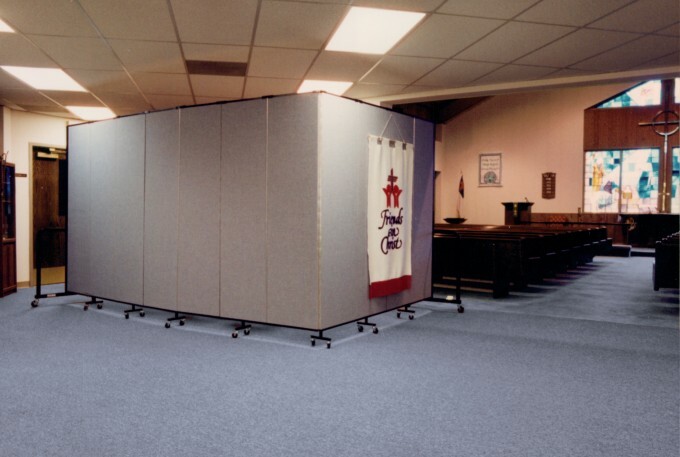 Our children are getting a better Christian education are words I’ve heard many times from customers since we began our Screenflex Room Divider business in the late 1980s. Here is a quote from a Christian magazine. “Young people are clamoring for a deeper understanding of religious perspectives on issues of the day and how moral and ethical questions are considered by the major. Different Studies have been done. The results are people tend to become less religious as they become more educated, right? Not necessarily, according to this new study. “The more educated a person is in their faith, the more cosmopolitan they are in their religious outlook,” he said. “They’re worldly in the very best sense of the term. They rub shoulders with people of different kinds of faiths every day and as a result, they have different visions of what it means to express your faith in the public. Different Studies have been done. The results are people tend to become less religious as they become more educated, right? Not necessarily, according to this new study.